1. Preheat the oven to 200°C, gas mark 6. On a lightly oured work surface, roll out the pastry to the thickness of a £1 coin and use it to line a 25cm deep loose-bottomed, fluted tart tin. Line the tart case with a piece of scrunched-up baking paper and baking beans. Blind bake for 20 minutes, then remove the paper and beans and bake for a further 5 minutes, until pale golden brown. 2. Meanwhile, place the butter, chocolate and ginger wine in a bowl set over a pan of barely simmering water. Melt until smooth and well combined. Stir in the mixed spice and stem ginger, then set aside to cool. 3. In a mixing bowl, whisk together the egg yolks and sugar until pale and creamy. Fold in the cooled chocolate mixture, ground almonds and cocoa. 4. In a separate bowl, whisk the egg whites until sti , then carefully fold them into the chocolate mixture. 5. Reduce the heat to 180°C, gas mark 4. Peel and core the pears, and cut into quarters. 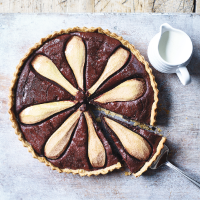 Spoon the chocolate mixture into the tart case, spreading it to the edges, then arrange the pears in a circle on top. Bake for 40-45 minutes, until just set. 6. Leave the tart to cool in the tin, then carefully transfer to a serving plate. Glaze with a little extra syrup from the stem ginger jar, if wished. Serve on its own, or with cream if desired.